Here is the breakdown: the calculations above include the current cost to take the exams and the cost of ALL reference materials. As of 2015 each exam costs $160 dollars for APICS members. Professional membership costs $200 per year. It is important to know that KEEPING YOUR CERTIFICATION requires ongoing financial investment and/or effort. 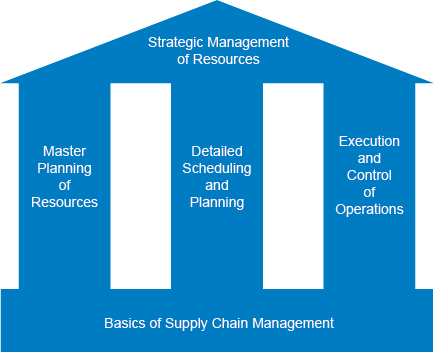 To ensure professionals are up to date with current best practices in the ever changing field of Operations and Supply Chain, APICS certifications are valid for five years. Every five years you will have to show proof that you are up to date with what is going on in the field. You can do that by taking courses, going to conferences, making presentations and going to Professional Development lectures organized by your local APICS Chapter. Don’t worry about this part for now. If you read carefully, you noticed that I said this is how much it will cost me. I am getting fully reimbursed but I am going to elaborate on that later with some advice (bookmark/follow this blog). By reading this post and looking at what I did to prepare for the exams you may be able to complete your certification for significantly less than three thousand dollars. It can also cost you more if you decide that you are going to need to take classes for some of the exams. Look at my costs and see where you can start saving money. Maybe you can find some of the books at the local library, buy used books, borrow or even find a free copy online in a pdf file. You can even buy these in electronic version at a discount for your Kindle! Click “follow” and shoot me a message if you want a spreadsheet with he cost breakdown. That way new totals are calculated any time you find a cheaper reference. I hear some can be found free online. 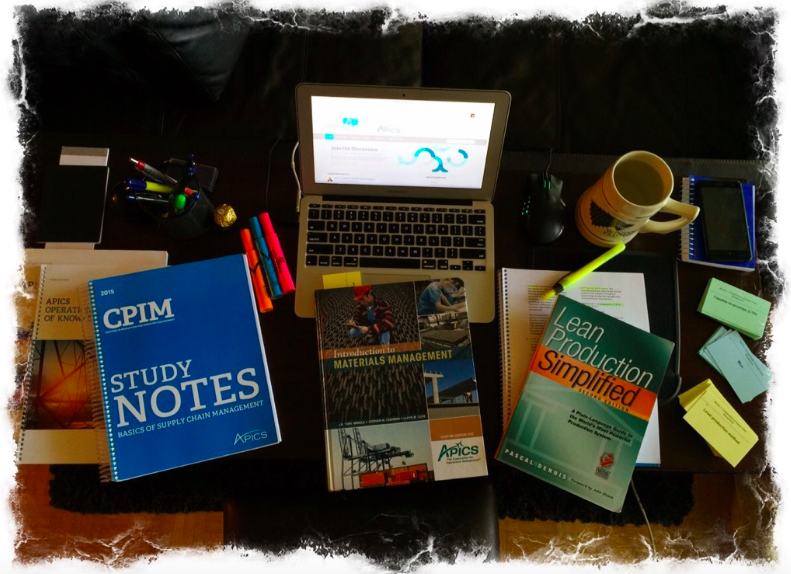 Reference Materials: Apics Dictionary (pre-owned), Intro to Materials Management ($98), Lean Production Simplified ($31), Exam Content Manual ($25), UN Global Compact (2 FREE brochures) and 2015 Study notes ($147). Cost of taking the exam once: $160. The dictionary is a MUST for all five exams. You can find the Exam Content Manual online and of the two books, Intro to Materials Management is the most important by far. I barely read the study notes I bought. The following books are not required but I recommend them: Eliyahu Goldratt’s The Goal, Jeffrey K. Liker’s The Toyota Way and Palmatier’s Demand Management Best Practices. I also recommend episode #561 of the podcast This American Life where they talk about NUMMI. It is interesting background info on the main differences between Japanese manufacrurong and American manufacturing. A lot of people swear by the Datachem but I completed 50 questions the day before the exam and stopped after getting just 2 wrong (they were too easy). There is a new tool online for $47 dollars that will let you complete a exam warm up and a timed exam practice, but it is entirely optional. If you are a nervous test taker it certainly buys you peace of mind. Check back next Tuesday for tips for taking the computer based exam using keyboard shortcuts and taking full advantage of the skip-flag review system. Bookmark this page and follow this blog for future updates. Look for useful info in my other posts: How to pass the CSCP Exam and upcoming CPIM BSCM Study tips. I live in Toronto but if you want to reach out, we can connect on Skype or Google Hangout with other students. Follow the blog, follow me on Twitter or leave a comment below. Excellent post silvio, i recently gave 2 modules and i can tell you as you have mentioned that ITM is indeed the most important of them all. Reading that only and ofcourse data chem and the apics simulator i was able to pass the exam. Thanks for the detailed information. I’m about to start the first moudle of the CPIM and i’m leaning towards the on line course. Do you have any expreince with the on line course method? You mentioned in your blog that you created acost breakdown spreadsheet, do you mind to send it to me. Thank yo in advance and i’m excited to read your expreinces from the cousrse in the future. it will be helpful if you share your experiences with the rest of the exam.